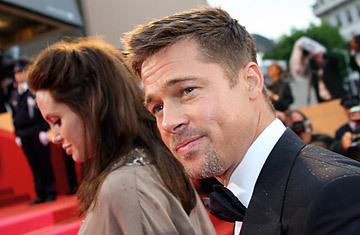 Brad Pitt and Angelina Jolie arrive to attend the screening of actor and director Clint Eastwood's film Changeling at the 61st Cannes International Film Festival in 2008. The Croisette, the beach-front street that serves as the main artery for the Cannes Film Festival, is festooned with balloons of a dozen colors, dotting the cloudless sky. The display is a promotion for this year's premier feature, Peter Docter's Pixar film Up, shown in 3D (a first for Cannes opening night). But the balloons might also be celebrating the high expectations for the official slate of films at Cannes 2009. To paraphrase Stephen Colbert's frequently asked question about George W. Bush: Will this be a great Cannes? Or the greatest Cannes? Skeptics have been predicting Cannes' demise for decades, ever since European and Asian cinema became the merest boutiques outside the juggernaut Wal-Mart that is Hollywood. American movies rule the box office in nearly every country they're allowed free access to, so who cares about art films? Acknowledging the challenge, Cannes' chief programmer Thierry Frémaux is savvy enough to pepper his slate with brand names and faces  folks who will get their pictures on TV, in magazines and on the Internet, and earn the festival free publicity around the globe. This year Cannes has star quality in spades; rather, in Depps and Pitts. But in France, the country that birthed the auteur theory, the real stars are the directors. Filmmakers who are not widely known in the States  Austria's Michael Haneke (The White Ribbon), Italy's Marco Bellocchio (Vincere), South Korea's Park Chan-wook (Thirst) and native son Alain Resnais (Wild Grass)  are considered masters here, and the prospect of a masterpiece from any one of them excites the cinemarati. But there's also a healthy representation of star directors known around the world. Ang Lee  whose Crouching Tiger, Hidden Dragon premiered at Cannes before becoming the U.S.' all-time top-grossing foreign-language film not made by Mel Gibson  is back with Taking Woodstock. It's a quasi-fact-based tale about the seeds of the 1969 music festival; Emile Hirsch, Liev Schreiber and Comedy Central's Demetri Martin are the headliners. May is a month often dominated by a Sam Raimi action film: his Spider-Man trilogy has earned $2.5 billion worldwide. But Raimi earned his early rep, or notoriety, with the low-budget gross-out Evil Dead horror films, and his Cannes entry, beguilingly titled Drag Me to Hell, marks a return to those dark roots. Joining Tarantino are Jane Campion, with the Keats bio-pic Bright Star, Ken Loach with the soccer drama Looking for Eric, and Lars Von Trier with his horror film Antichrist. That makes for three winners of the Palme d'Or in the 2009 competition. Another returning champ: U.S. film-critic superstar Roger Ebert, of the Chicago Sun Times and many books and TV shows. Roger missed the last two festivals battling throat cancer but will be back this year, his critical voice as strong as ever. The festival poster this year is a shot of a blond woman, seen from the back in a spaghetti-strapped black dress, peering out at the sea. It could be the Mediterranean, the backdrop to the Grand Palais. But it's actually a remote Italian island; for the photo is from Michelangelo Antonioni's L'Avventura, a sensation when it showed at the 1960 Cannes fest  sensational because it was greeted with both acclaim and perplexed hostility. In Antonioni's modernist adventure, the central mystery of a missing girl was never solved. We hope that all the enigmas of Cannes 2009 will be answered by Sunday, the 24th, when on the closing night the Palme d'Or and other prizes will be announced by the Jury President, actress Isabelle Huppert. For two TIME.com critics, this is our 36th festival on the Cote d'Azur. Though the quality of the films is wildly variable year by year, the expectation of discovery never wanes. Each day we'll keep you informed of the surprises, good and bad, as we pursue our 2009 Cannes adventure.